24, 13, 12-16. No, these are not the numbers to the Lottery; these are more simply the numbers of the program. 24, from 13 different countries, students of the Master’s degree in “Food Culture and Communication: High Quality Products”, for four days, from May 12 to 16, have got around the provinces of Naples, Caserta and Salerno in a path of awareness-knowledge of local culinary excellences. Like the wealthy young aristocrats, from the province of Cuneo, the future professionals for the food and wine sector embarked on a sort of modern Grand Tour with destination, this time, Campania to find the good things that offers, specialties that make this land famous all over the world. In Naples, the first pit stop for a workshop on Neapolitan pizza. As for the other editions, Enzo Coccia has been chosen. 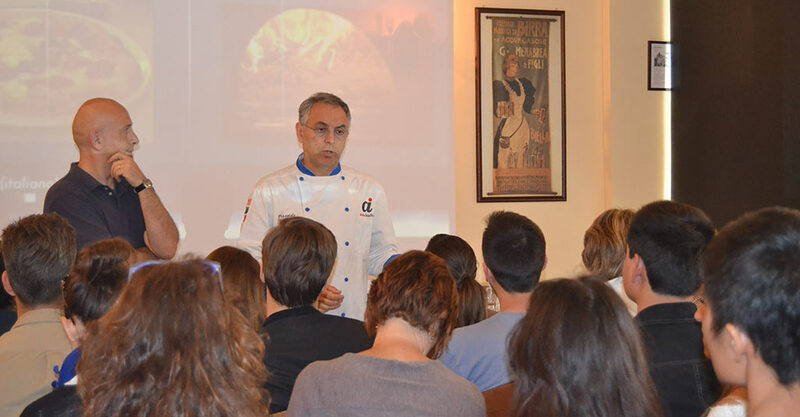 He opened the doors of his pizzaria and turned it into a classroom to receive the students of the University of Gastronomic Sciences. A structure, in fact, the first and the only one totally dedicated to the culture of taste, that 10 years after its foundation, since the vaults in neo-Gothic style of the Tenuta Albertina dell’Agenzia of Pollenzo returned to their former splendor to host the institute built by Carlo Petrini and Slow Food, in collaboration with the regions of Piedmont and Emilia-Romagna, has seen more than a thousand of young people, from the 5 continents, sitting at the desks of that wide building, today one of the various Savoy Residences. During the “lesson”, the owner of La Notizia retraced, with theory and practice, discussions and pizza slices, all topped with the screening of the short movie The sun on a plate, the history and the different steps in making this ancient dish. After flour, dough, pizza balls and stretching of the dough disks, the students, traveling with fork and knife, juggled with the dairy products, the Campana Buffalo Mozzarella, the Provolone del Monaco and the Fior di Latte from Agerola, then with the land products, the San Marzano tomatoes, the wine and the violet artichoke from Castellammare, where, on the seaside, they spoke of blue-fish. They could not choose a better ending to their tour around the Campania in four days with the bronze wire- drawn pasta di Gragnano. And Enzo Coccia doubled with Slow Food when, on May 19, dedicated an event to its members. While “Good, Clean and Fair” echoed between the walls of his shop, the master pizzaiolo’s hands made irresistible creations enriched with many Presidia: piennolo tomatoes, Neapolitan papaccelle, Cetara anchovies “colatura”, white artichokes from Pertosa and Castelpoto red sausage to adorne the fantastic Classic Double Face for first, then the saucy Riccia and papaccelle, followed by the majestic Regina dei Presidi and at the end the more popular Carrettiera. It is time to say “which side are you on”?